The Cleveland Plain Dealer today reported that Ohio Representative Josh Mandel will return to Iraq. 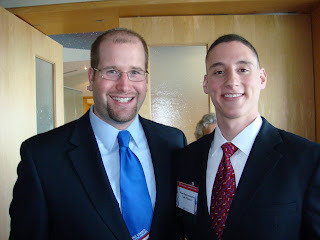 I met Josh at an AIPAC event this past Spring in Columbus. He's a very impressive guy who cares passionately about our government, the State of Israel, and humanitarian causes worldwide -- especially in Sudan. State Rep. Josh Mandel will trade the buttoned-down look of a state lawmaker for the desert camo gear of a Marine as the 29-year-old reservist is headed back to Iraq. The freshman state lawmaker, considered a rising star in Ohio Republican circles, has volunteered for a second stint in Iraq as an intelligence specialist in the Marine Corps. "I didn't join the Marine Corps to say no when the Marine Corps needed Marines in my field," Mandel said Thursday. Mandel, who was elected to his first term as state representative in 2006 after serving on the Lyndhurst City Council, previously served a tour in Iraq in 2004 as an intelligence officer attached to a battalion in the Al Anbar region, an insurgent stronghold in western Iraq. He will undergo about six weeks of training in the United States before returning to Iraq this fall for an approximate eight-month tour. He said he isn't sure yet exactly what unit he will be stationed with in Iraq. Mandel said he has already pulled petitions for re-election and will keep his seat in the legislature while he serves in Iraq. He said he believes the people who voted him into office will support his decision to hold onto his seat. During his first seven months as a lawmaker, Mandel stirred up controversy with a bill he sponsored that would have required Ohio retirement systems to divest themselves of roughly $1.1 billion in investments in companies doing business in Iran. Oh, what a small world. . . .Josh is my brother in law (married my older sister, Ilana) and a great guy. It's been a while, hope all is well with you and the family.